Now that you’ve found out you’re pregnant (congrats! ), you may be wondering… What should I buy in my first trimester? What should I avoid? The first trimester refers to weeks 1-12, and a lot happens during those 12 short weeks. Your hormones are soaring. You may feel unusually tired. And if you’re around 6-7 weeks pregnant? You may already be experiencing the dreaded morning sickness. 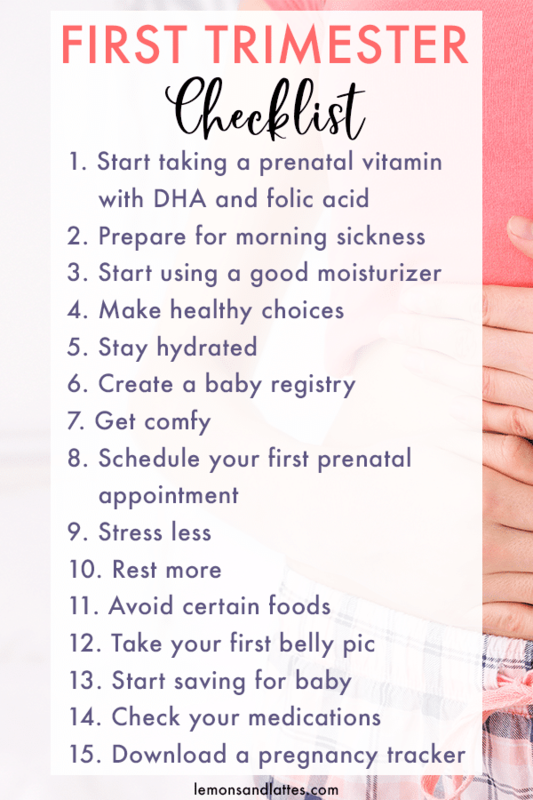 This first trimester checklist will help you stay on top of the main things you need to do in your first trimester of pregnancy. Prenatal vitamins with DHA and folic acid are a definite first trimester must-have! This March of Dimes article recommends that pregnant women get 200 mg of DHA per day to help your baby with healthy brain and eye development. It’s worth noting that some of the prenatal vitamins on the market, especially the gummy versions, don’t have anywhere near close to this amount. These prenatal softgels, however, DO contain the recommended 200 mg along with the other key vitamins and minerals. Quick tip from one mom to another: If taking your prenatal in the morning tends to make you sick, try taking it in the evenings instead! I had morning sickness with both of my boys. It’s no joke! Fortunately, there ARE some things you can do to help you prepare for and ease morning sickness. I’m a huge fan of morning sickness tea instead of the typically recommended ginger ale. Most ginger ale contains high fructose corn syrup and isn’t made with real ginger at all. Instead, try a morning sickness tea like this Pink Stork tea for nausea. Always check with your doctor first, but another remedy you can try for morning sickness relief is vitamin B6 (source). Lots of moms swear by these Pink Stork Morning Sickness Candies— They contain vitamin B6 + ginger and they’re organic! When I was pregnant with my first son, I kept saltine crackers by my bed at all times. Sometimes I would even even a couple before getting out of bed to help settle my stomach. With my second son, I snacked on salted pistachios. Pistachios are lower in calories compared to some nuts and contain roughly 37% of the recommended intake of vitamin B6 (source). Even though you won’t have a bump yet in your first trimester, it’s never too early to get started with a good moisturizer. Your skin will be doing lots of stretching in the coming weeks to accommodate your growing baby. The sooner you start prepping, the better! I love the Earth Mama Belly Butter because it’s rated zero for toxins– No synthetic fragrances, phthalates, parabens, etc.! Or at least… try to! If you’re experiencing morning sickness, it’s definitely easier said than done when the only thing you feel like eating is starchy french fries. My best advice is to try to make healthier choices when you feel like you can (usually later in the day). The nausea usually get much better by the second trimester! H2O is your new best friend. But, how many oz. of water should a pregnant woman drink? On average, pregnant women need to drink about 10 oz. of liquid per day according to this article. But it’s always best to ask your doctor if you have questions or concerns. I love the Bellybottle pregnancy water bottles because they have the hourly drinking lines printed right on the bottle to help you stay on track throughout the day. From here onward, you’ll probably read tons of baby registry checklists. Why not go ahead and start your baby registry now so that you have somewhere to direct family and friends when they ask? Not sure where to create your registry? I always recommend Amazon because of their massive selection and 90-day returns! Click here to create a baby registry on Amazon. When you’re not feeling your best, it really helps to dress as comfy as possible. For me personally, that meant ditching bras with underwires for a while. These are the perfect if you’re looking for a comfy + supportive maternity bra that you can also wear when you start nursing. I also love the My Lala Leggings! Go ahead and call and schedule your first prenatal appointment. 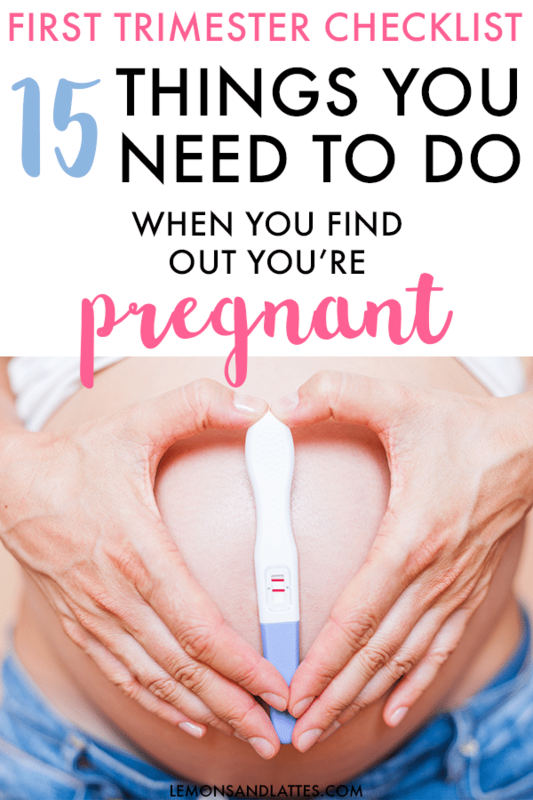 It’s easy to feel overwhelmed in your first trimester if you start overthinking everything. I’ve seen lots other checklists that tell you to start thinking of baby names, birth plan, etc. right away. You have plenty of time for that! Right now, you should be focusing on taking care of yourself and stressing as little as possible during these first crucial weeks. It’s not uncommon to feel more tired than usual during the first trimester of pregnancy. If you have the chance to rest or take naps, do it! Your body is going through a lot of changes right now. Don’t feel guilty about getting extra rest right now. When I found out I was pregnancy with my first son, I researched like crazy! I was surprised to find out that some foods should be avoided during pregnancy. Here’s a quick rundown of the top foods to avoid, but as always, ask your doctor if you have questions or concerns. High-mercury fish – Tuna, king mackerel, swordfish, shark, etc. Additionally, it’s best to limit your consumption of caffeine. With my first baby, I avoided it entirely and with my second, I limited myself to one cup of coffee per day. I urge you to do your own research. Yes! Even though you don’t have a bump yet, take your first belly pic. You’ll love comparing your pictures as your bump grows. This app has really cute pregnancy milestone stamps you can add to your pics. Starting a budget now will help you prepare financially for having a baby. It’s so nice to have a nest egg set aside so you’ll be completely prepared for anything baby might need in the future. Need help getting organized and getting your finances in order? 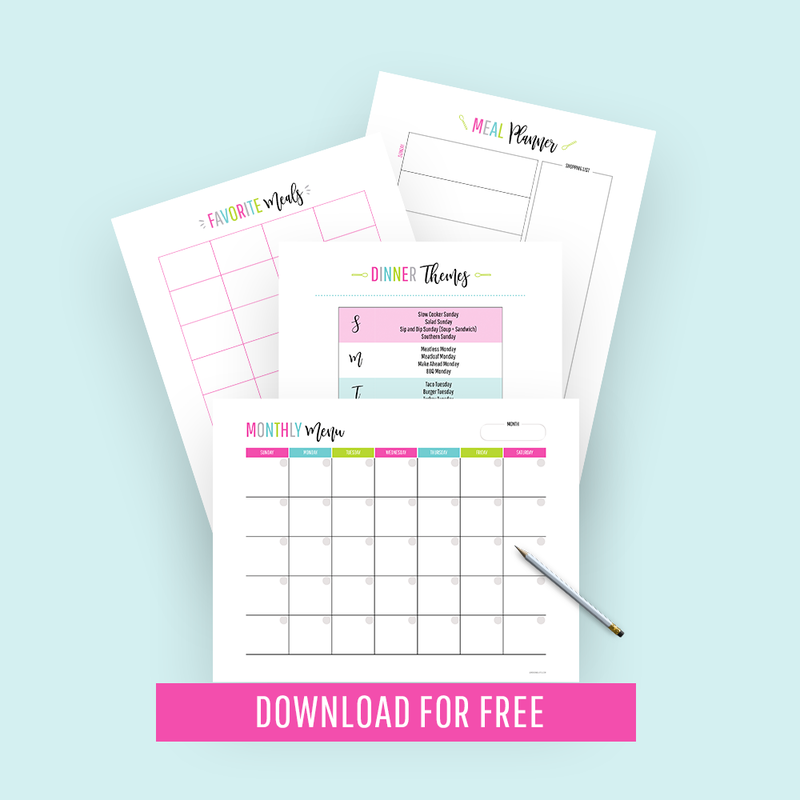 Try these worksheets! Are you currently taking any medications or supplements– including natural/herbal supplements? You’ll definitely want to double check and make sure they are safe for baby. I was surprised to find out some of my herbal supplements were not recommend during pregnancy. One of the most exciting things about being pregnant is checking to see how big baby has gotten each week.